I'm in Sweden on a long-awaited vacation for the next two weeks, having spent the Swedish unofficial national holiday Midsummer with friends in our family house on the south east tip of the country. Despite the extraordinary setting and great dinner party - orthodox with pickled herring, fresh boiled potatoes and sweet strawberries with cream - we struggled to keep warm in the refreshing but chilly north atlantic winds and finally I decided to cut my stay short and go back to the city (Malmö). Truthfully I was very fed up with Beijing towards the end and coming back here for a short but familiar visit will really help me put things in perspective. My current project in the pipeline, I am sucking up the Scandinavian vibe in order to release it with new powers on my return. But of course, things are never as easy as that and it will really be a challenge to bring a genuinely nordic feeling to China. If anyone can do it, at lease I hope I have a good chance. And soon I'll let you know what it's all about. Until then, some photos from over here. Summer house by and for Danish architect Erik Bystrup of Bystrup arkitekter. Last week I was reading some references for my upcoming book project about Yongding river in western Beijing. One of them is Subnature by David Gissen, in which a number of "man-made" natures, the biological biproducts of urban activitites, are given special focus. In each chapter, Gissen retells the historical and philosophical background of a Subnature; how and in which context it has appeared in historical documents, how it has been used and viewed upon, and finally pairing it with one or a few contemporary projects which explore its architectural potential. The book devides these Subnatures into three categories: Atmospheres (Dankness, smoke, exhaust), Matter (Dust, debris, mud) and Life (weeds, pigeons, crowds). Featured in the chapter about debris is Arata Isozakis Re-ruined Hiroshima from 1968, a project emerging from a mutual fascination for one the one hand ruins and on the other superstructures. In his collage the wasteland of post-nuclear Hiroshima provides a backdrop for these mysterious structures which, either appear to be constructed from the debris of the destroyed city, or, in a more fantastic interpretation, landed from above like an alien object, ready to redistribute themselves as the raw material for a new city fabric. Either way, his striking view of this obliterated city seems curiously familiar when confronted with the desolate images inundating us, from the same country albeit further North. I am not someone to romanticize on destruction, especially with the (abstract) knowledge of how many lives were taken out and chronically disrupted by the earthquake and following tsunami. Yet one can't help start to wonder what kind of architectural response could be triggered by this devastating event. If we conclude that the last decade in Japanese architecture has been characterized by playfulness, lightness and experimentation, it is also important to note that these tendencies to a large extent are restricted to a particular scale; that of single-family semi-detached suburban house. This limitation could of course be attributed to the level of development that Japan has reached, which on a larger scale has been coined the Japanese Economy Stagnation. In other words, large-scale construction is no longer a main component of the economy. Instead, the combination of a refined and well-educated middle-class and rather permitting urban policies have given rise to the continuous stream of meticulous photos of experimental houses reaching the laptops and coffee-table magazines of admiring (if not to say, jealous) architects around the world. Currently, though, we are perhaps not so jealous. 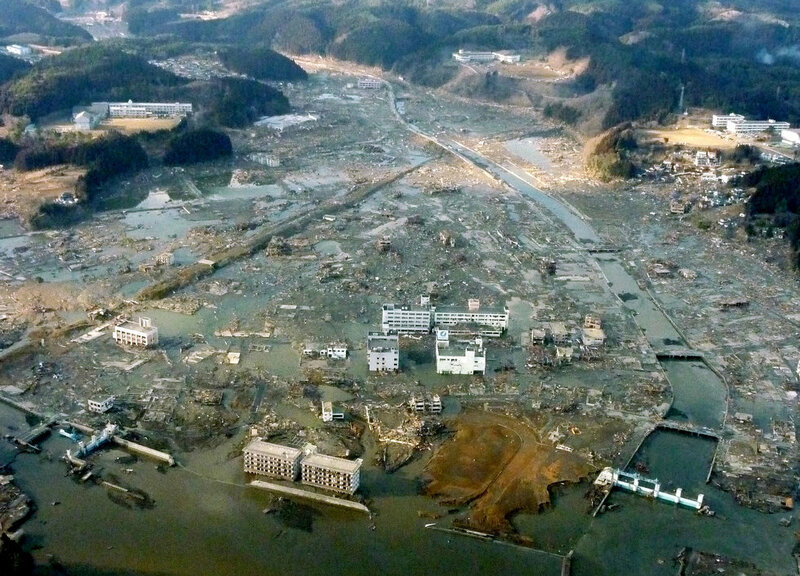 The amount of damage done to the Japanese cities in the vicinity of the earthquake and tsunami are not small. Nevertheless, a few days after the earthquake, Japanese stocks were again rising because of the immanent need of reconstruction, which will generate well-needed growth to the economy. Putting the economic issues aside, I am curious to see if and how our Japanese colleagues will change their practice in the coming years. 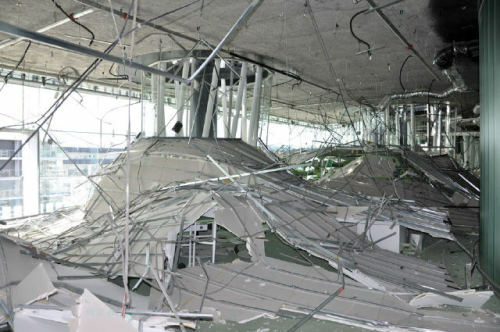 Finally, an photo of Toyo Ito's Sendai Mediatheque after the earthquake. Badly damaged, it actually looks worse than it is, as the structure is still standing and most of the debris in the image seems to deriving from the suspended ceiling. Yesterday a long awaited book was finally delivered to our door: CHANCE from the series Documents of Contemporary Art (MIT Press, 2010). Compiling texts on 20 or so conceptual artists that all have worked with the unpredictable as a main driver of the work, the book narrows down the concept of chance to a few - shall we call it - case studies. The most reoccurring artists Marcel Duchamp and John Cage fail to surprise me. Needless to say, the importance of the former is monumental. The fact that Duchamp held an all-embracing attitude towards chance is perhaps the most prominent aspect of his work. Cage, on the other hand, is still quite unknown to me, and I am looking forward to getting a broader sense of his works and impact. For my part, the concept of chance remains quite important. In the projects I have developed in the past three years I have left part of the design to chance with, shall I say, mixed, but predominant success. It is with this in mind that I aim to look deeper into the art(y) references to understand the potentials of chance as an ingredient in an architectural exploration. Below are some images from my thesis project LINE-POINT-FIELD where I used a Drawing Machine - essentially a table with a number of acrylic plates and a projected mounted at the bottom - to distort and reproduce my original drawings. As a strategy to achieve a level of complexity that would be difficult to design, this tool did what I wanted it to. Bringing the table into the photo lab, I allowed the force of light to play a role in the process. Despite not using the drawings directly in my project, the logic related to the drawing machine became very important for the further conceptualisation. While my dirty laundry is getting new life at the Vascomat down the street here in Islands Brygge Copenhagen, I am taking this half hour (although I'm expecting it to be extended after the laundry is done) to review what I have produced in the past three weeks and sum up what the project is about. The fact that I haven't taken the time to reflect, instead carrying on like a streamlined bulldozer producing mostly drawings, diagrams and a few models in various scales, might be my most serious mistake. Evidence of this came up in the rather exhaustive crit session yesterday. My biggest challenge as an architect (and as a person?) is and has always been to locate a specific field of interest and to investigate its possibilities as far as possible without losing interest after one or two trials. Basically, I have an underlying fear to lose touch with the bigger picture if I indulge myself in something seemingly small an insignificant. That the big pictures, the grand gestures and utopian political statements are more compelling than the small steps and informal inventions that really move society forward, albeit inconspicuously. Which is about as far from true as could possibly be. The problem is, of course, that I am better at this retrospective self-evaluation than actually changing my way of thinking. It is inexplicably difficult to radically shift focus as a designer, from abstract concepts of axes, points, slabs and junctions to non-architectural elements like blood cells, 1967 Cadillacs and Emmental cheese. How do I know that my specific point of interest has the potential to tell a bigger story? How does a park pavilion change the world? The last question is very close to what my project should be. The problem is, I did not formulate that question until now. The question so far has been: How do I turn a steelworks and dried-out river in Beijing into a productive and recreational space and dwellings using an axis? Needless to say, the answer to that question is probably not a doorknob or even Emmental cheese. But perhaps this juxtaposition is my best bid for finding the key to this project. So far, I've been trying to solve all the problems (cleaning of polluted soil, laying out of agricultural plots, legitimization and transformation of existing industrial structures, finding strategic principles for the development of the village, finding suitable plants for the almost dry riverbed etc) individually through a sort of composition, each problem relying on the other but without strong conceptual guidelines. The result is a heavy pile of drawings that compose without being specific and speculate without being consequential. In short, I am lost inside my project. Until now, perhaps. As I am writing this, I am getting inspired to sketch down the outlines of my project in a different way. Using familiar concepts and excluding my seemingly unnecessary investigations of 'site-specific morphology', I am kind of back to square one. Everything that I wrote in my programme is still extremely valid and surprisingly solid as a framework. The problem is that the most logic approach should have been to use parametric tools, not by building an explicitly analogue drawing table that produces compelling photo prints. Especially since I'm not really using it according to my original intent. So, again by breaking my programme down into two categories; Bottom-up and Top-down, I can start to understand where I can get the most juice out of my expertise as a designer and planner respectively. Basically, Bottom-up is a generic framework within which things can take place, informally and without the involvement of the designer. In the case of building matrixes, a general FAR and height is specified. Top-down is the layout and design of the specific functions that support and stimulate occupation of the generic. My first reaction to the text above was the conclusion that I had to go back to square one and build a Chinese version of Parc de la Villette; Tschumi's proposal, which was built and works by distributing programme in the follies, liberating the surfaces to be more generic, essentially an updated version of the classical French Garden. The buildings are the main carrier of meaning while the fields produce the “event space” in between where anything can happen. Koolhaas' proposal was more radical and urban. By being much more specific in the treatment of the fields, he wanted to create a condensed social environment. Moving through the park across the 'strips' would be like taking the elevator through a skyscraper. Moving along the strips would thus be equivalent to staying on one floor. It's rather a shame that Tschumi won with his rather classical distribution strategy. Instead, we missed the chance to see how Koolhaas would perform as landscape architect. In my first analysis of these two proposals, I concluded that Tschumi's generic element was the follies, while Koolhaas' was the strips. In fact, I am now beginning to realize that it is the other way around. The follies are, at least in practice, rather rigid in their programmatic content. Today, almost all the follies have a fixed specific function, disabling their ability to change over time. The same goes for the theme gardens. The surfaces remain generic, being open green lawns, pretty much as we know them from your typical 19th century urban park. In the proposal that OMA submitted to the second competition phase, the strips were clearly specified, creating a compact barcode of different vegetations and social functions. As Koolhaas describes in his book: “In the first submission we explained how it works. Now we will show how it looks”. And the pictures of the giant model that filled up a whole room in the office, leaves no doubt that there was a high level of specificity in their final proposal. Returning to my own trials and tribulations, I can conclude that I have spent a lot of time designing the fields, how they work and develop over time. They are thus not any more generic than my buildings, which remain rather undeveloped. So maybe this project will be better off following Koolhaas' Villette strategy; By being extremely specific about the landscape, I can let the buildings remain as supporters of that landscape. This is essentially much more interesting as a critique of Chinese planning and architecture. The experience of moving through the urban landscape is far more interesting than the individual buildings that make up it. As expected, I haven't had time nor energy to write during the first phase of this project. Despite being a great way to clear your mind and sum up the workday, I simply don't find the time to write without it affecting my sleeping or leisure hours. Today, though, apart from being the first day of Easter and April fool's, is our half-time rest, giving my the chance to summarize the first 50 days of my diploma project. In brief, I am working on a hybrid park, a new kind of urban typology, in Beijing. Essentially a synthesis of recreational space (park), productive landscape (agriculture) and habitation (housing), the project rethinks an industrial zone and dried-out river in the west part of Beijing, and its junction with one of the city's main axes: Chang'an avenue. It all started in December last year when I was introduced to the area by my teachers at Tsinghua University, Ron Henderson and Brian Chang. Ron being a landscape architect, we were given in-depth knowledge about the region and its history, the Yongding river and Shougang steelworks. My pilot project in the urban design studio was a strategy based on the observations of the Chinese use of the axis as a way to organize buildings and complexes. By extending the Chang'an axis as a series of buildings instead of just extending the road, a new kind of identity could be given to the area, highlighting its environmentally abused surroundings by contrast. In January, after returning to Copenhagen, I developed the strategy in my programme, written as a series of small essays on the history of Chinese planning, landscape architecture and public space, as well as analyses of precedents such as Parc de la Villette in Paris. The intention of the programme is to implement a developed strategy comprising two major layers: Fields and Locales. The locales is the string of new public functions along the axis and the fields make out the horizontal layer of recreational and agricultural space. The real challenge is to design the planning and development of these layers over time, essentially a kind of choreographed architecture that assumes its position halfway between top-down and bottom-up design strategies. I started by documenting surrounding sites which describe some of the the programme of the new park; agriculture plots, the riverbed, hills, gravel pits, villages, industrial sites and housing communities. As I could get aerials from every year between 2002 and 2009, I could see how the sites have evolved over time and what forces are at play in the landscape (in a general sense). These registrations will be essential to the formal and conceptual development of the project. The first attempts to formalize these became very attractive, collapsing the layers into a complex weave of lines and solids. I used a custom-made table to superimpose the layers onto a sheet of paper or eventually photo sensitive paper, which I developed in the lab. Finally I attempted the same approach in the virtual environment, superimposing the drawings onto my own site and making collage-like drawings that could give the same kind of suggestive complexity as the photo prints. Despite creating very compelling images, it didn't really work in line with my design strategy and I am now back at square one, struggling to find a method to draw and build my project in different stages of its transformation. Concluding this first half, I am taking small steps only to go back to my original ideas. In general I am slowly understanding how NOT to work, that is, by producing beautiful images from research and using them in a formal way. Instead, I should focus on the genetics and behaviour of my "prototype sites". Which is, needn't be said, quite abstract. Hopefully I will be able to contribute with some slightly more elaborated thoughts on the process further on. Yesterday, after an unveiling discussion with my guest advisor Anders Abraham, I suddenly knew, clearly, what this project is about. As it had been hidden in a veil of lines, points, concepts, images and information (which, by chance, evokes an interesting picture in itself), the main issue that I want to address is the same as the man above. Or perhaps transformation, as the architect who insists in using a form(al) language would rather call it. So how do we address the issue of change? How do we, as architects, address the full lifespan of our creations and not just the moment when the scaffolding has been taken down and the tenants start moving in? I am not talking about taking the building's use into account when designing, that is intrinsic. Instead we should plan for a greater contingency, a kind of programming, a long-term performance where the architecture becomes the stage set, transforming from one scene to the next. And we are the actors. Or You. I am just the set designer. Best case scenario, my project will begin to speculate about the possibilities of controlling the architecture long-term, perhaps centuries. One could of course begin to interrogate to the advantages of such an idea, but strangely we do not question the reasons why our parks are maintained and preserved over centuries. Once built, the parks are in themselves representations of the 'nature' we miss in our urban jungles, a nature that is in constant change and over which lack control (although we are trying our best to overcome it). The scale of the park admits a great amount of control to be exercised over such a vast territory, while the city around it morphs into new shapes and heights over the decades. We are also reluctant to let parks transform by themselves. Sure, there is an inherent change in the physical environment; trees, shrubs, plants grow and need to be cut, but we would be outraged if the maintenance of our parks failed and we would see weed taking over the lawns and the cubist hedges become shabby shrubberies. Few parks actually make use of the transformations we would normally find in nature. However, I recently found some interesting examples in the Ruhr area presented by Jörg Dettmar in Landscape Architecture in Mutation, a collection of essays on the conditions of landscape architecture and planning in the post-industrial landscapes of Central Europe. Mr Dettmar refers to a number of pilot projects where different strategies to the growing problem of derelict sites in need of maintenance, without aiming for complete redesign. In the example of Duisburg North Landscape Park, I found many similarities with my own project, with a number of programmes that make use of common industrial building structures like gasometers and blast furnaces. The main difference is the conditions in Germany compared with China in terms of land use. While Germany witnesses shrinking cities and suburban sprawl with much in-between space in the following, China faces the opposite; extreme density and shortage of land for development. Thus, my project will have to deal with a similar issue - what to do with former heavy industrial complexes - but from a point of view that the city wants to move in rather than move out. So the next question could be; How do we deal with this pressure? How do we sustain the potentials of the site (and its symbolic location) while maintaining economic feasibility?